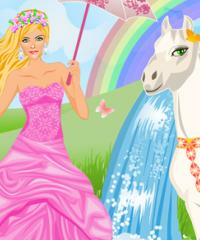 Play an awesome princess fairy tale dress up game. This beautiful princess is the owner of the magical white horse. She is a very responsible pet owner and takes a good care of her horse all the time. Her name is Susie and she lives in the castle you can see in the background. It is raining a little and you can see this amazing rainbow behind the castle.